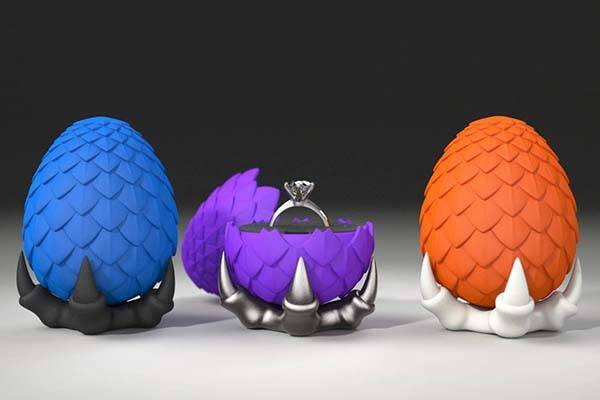 The 3D printed Game of Thrones dragon egg ring box gives you a pretty cool way to hold your precious wedding ring. Like the idea? Let’s continue checking. This is a well-crafted and eye-catching ring box inspired by Game of Thrones. The ring case measures 47 x 58 x 47mm, and as we can see from the images, it’s molded after a dragon egg from the well-received TV series. Meanwhile, the dragon egg replica shows off charming contours and exquisite details that meticulously present the initial form of the mysterious creature from Westeros. The dragon egg ring box is 3D printed in metal or plastic for durability, and it comes in 12 optional coatings to meet different personal preferences. Moreover, it’s available in two optional ring holder in different sizes in order to fit for thin or thick ring. Of course. it perfectly matches the dragon inspired sterling silver ring. An optional 3D printed stand is shaped as a dragon claw, which keeps the 3D printed dragon egg in place and perfectly matches the style of ring box. 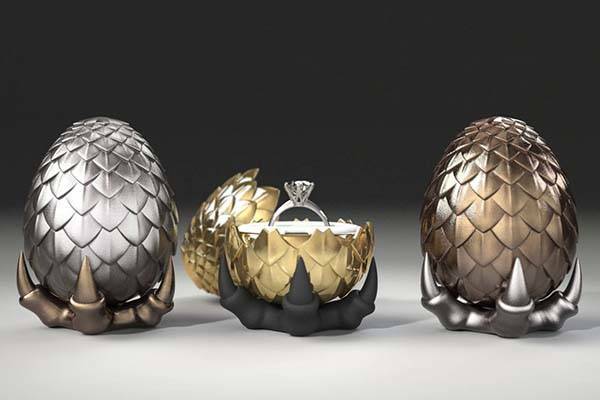 The 3D printed Game of Thrones dragon egg ring box starts at $46.90 USD. If you’re interested, jump to Etsy for its more details.